Dubai, UAE, January 14, 2019: All the svelte and sensuous good looks that are the characteristic of Eberhard & Co.’s ultra-feminine Gilda line, come through every curve of the new Gilda 61008.3 timepiece. Designed for the woman of style, this Gilda, like the rest of its stablemates, can also boast of the highest standards of watchmaking design and craftsmanship. Irresistibly sinuous in look and feel, the new Gilda is inspired by the beauty of nature and its varied forms. 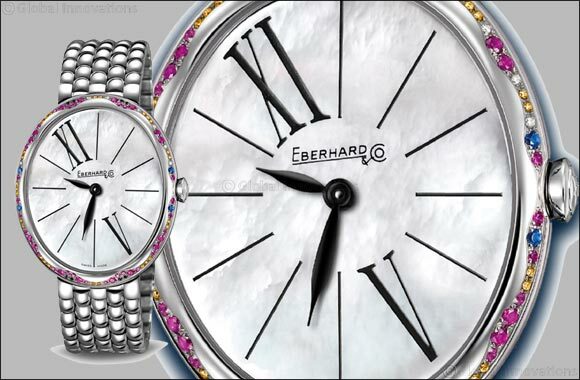 Its curvy face encloses is enclosed in a stainless steel case, the bezel set in rubies, diamonds and zephyrs. The hour markers are set off in black against the white gleam of the dial, with the quarter hour marked in elegant Roman numerals. The timepiece fits snugly on the wrist held either by a Chéri® steel bracelet with a déployante buckle engraved with E&C or a crocodile strap with a buckle engraved with a letter E.